In hot rolling mills, premature failure of rolls is a major concern as it adversely affects the mill operation as well as production. Analysis of failed roll materials and actual rolling conditions in service are therefore necessary to understand the roll failure mechanism and thereby improve the wear resistance and extend the service life of rolls. The hot strip mill referred here consists of six stands wherein high chromium (Hi-Cr) iron rolls and Indefinite Chilled Double Poured (ICDP) cast iron rolls are being used for finishing rolling of the strips in the last two stands. The thin strip mill produces strips in the thickness range of 1.0–12.7 mm. 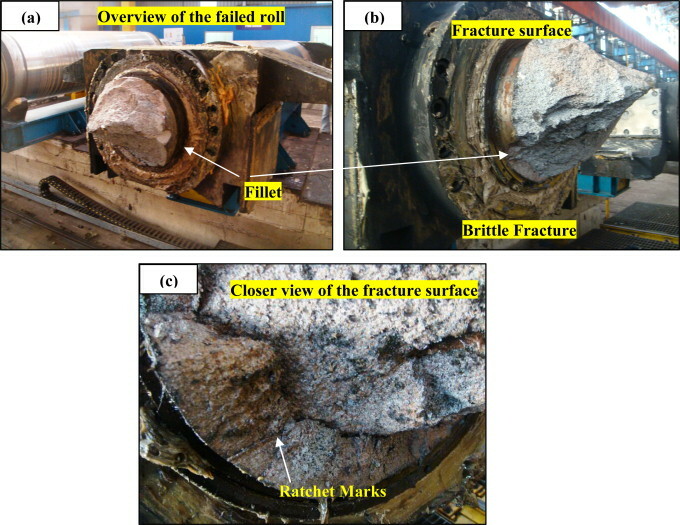 This work describes two different types of roll failure cases and their analysis which was carried out using destructive as well as non-destructive testing techniques (NDT). Ce contenu a été publié dans Etude de cas, Publications par geraldb17, et marqué avec analyse de défaillance, brittle fracture, case study, Failure analysis, Fracture. Mettez-le en favori avec son permalien.